Home / Workforce Equity Board Meeting – Join Us! 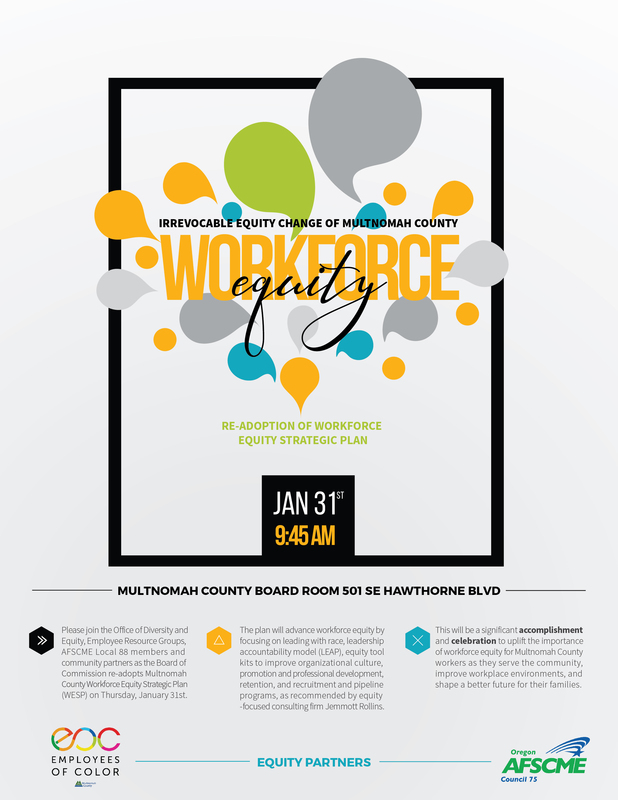 Please join the Office of Diversity and Equity, Employee Resource Groups, AFSCME Local 88 members and community partners as the Board of Commission re-adopts Multnomah County Workforce Equity Strategic Plan (WESP) at the Board of Commissioners’ weekly meeting this Thursday, January 31, 2019. Please join us at the board meeting at 9:45 a.m. The implementation plan will advance workforce equity by focusing on Leading With Race, developing and utilizing a Leadership Accountability Model, and using a Countywide Standardized Equity Tool Kit that will improve organizational culture and provide employees with the resources they need as the WESP is being implemented. This plan also includes utilizing a Human Resources Equity Tool Kit that will enhance the retention & recruitment of employees, as well as promotion and professional development, and pipeline programs for employees as recommended by the equity-focused consulting firm Jemmott Rollins. This will be a significant accomplishment and celebration to uplift the importance of workforce equity for all Local 88 workers as they serve the community, improve workplace environments, and shape a better future for their families. The presentation is scheduled for 10:05 a.m. and will take place in the board room of the Multnomah Building at 501 SE Hawthorne Blvd, Portland, OR 97214.